March is National Tick Awareness Month! 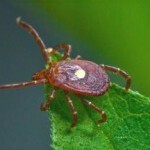 It’s not the beginning of tick season per se (there is no official “season” where ticks are concerned), but rather the time of year Canadian veterinarians (& especially veterinarians in southern Ontario) revisit the subject of ticks knowing that people & their pets will be spending more time outdoors as Spring approaches. 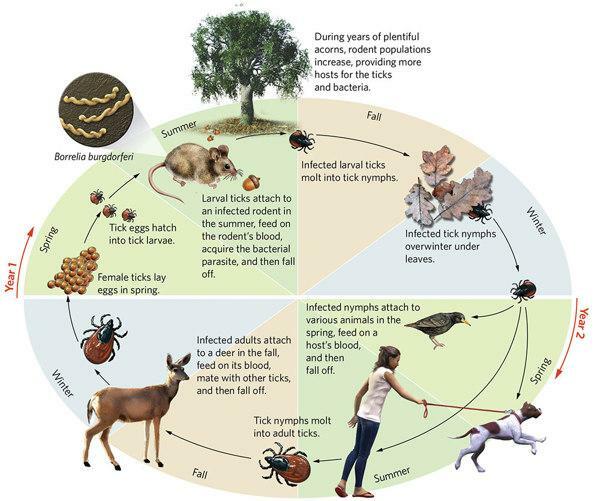 Our complete primer on ticks follows, but here’s a summary of key points that are top of mind. 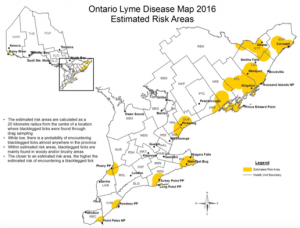 Toronto is considered a risk area for Lyme disease. Interested in how Toronto is faring where ticks are concerned? Click here for more information about the city’s tick surveillance program: Backlegged tick surveillance – City of Toronto. This website includes a link to the map shown below as well as data on the number of ticks found in different parts of Toronto. In 2018, about 35% of backlegged ticks in the Rouge Valley tested positive for Borellia burgdorferi (the causative agent of Lyme disease). 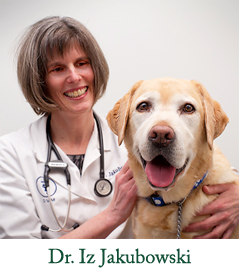 By the way, you’re invited to be a citizen scientist & help Dr. Scott Weese of the University of Guelph with his tick surveillance efforts by submitting information about ticks you find on your pet here: https://www.petsandticks.com/ticks-submissions. There’s lots of other useful information at this website as well, including some of the latest research on the subject. As more information becomes available about the numbers of ticks carrying Borrelia in our area, we’ll keep you posted, but in the meantime, you can assume that at least 20% of our deer ticks are carrying the bacterium. Tick activity is temperature-driven, not seasonal. Any day it’s 4ºC or higher (or to be on the safe side, let’s say above freezing [0 ºC]), ticks come out of hiding in search of a meal. 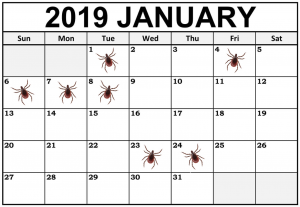 We’ve been monitoring weather patterns for a number of years now, & it’s become clear that while the weather is unpredictable, you can count on ticks being active through the winter. Take this winter, for example. One day, the temperature dropped to a frigid -21ºC in late January only to rebound to a balmy 11.7ºC a week later. About half of January saw temperatures above 0 ºC and almost 25% of the month saw temperatures above 4 ºC. The calendar below shows days that the temperatures rose above 4 degrees – in the dead of winter. Given that Toronto is on the map as a risk area for Lyme disease, & winter months here continue to see temperatures that support tick activity, we recommend year-round tick protection to ensure your dog is covered during those warm spells that are becoming a norm through the winter. Tick-borne diseases like Lyme disease are preventable! We’ve run the numbers & it’s less expensive to prevent transmission of Lyme disease for a full year than it is to treat it. And because we still don’t know enough about subclinical & long-term effects of the disease, your best bet is to take appropriate steps to avoid it. Bravecto® continues to be RYAH’s ‘go to’ for tick prevention. 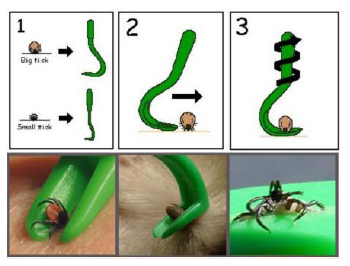 It’s safe, effective (it kills ticks before they have time to transmit Borelli burgdorferi), & it lasts 3 months. That means fewer treatments per year & fewer gaps in treatment. Note: Bravecto is also available in a topical version for both dogs & cats. Like to do your own research? Here are some reliable places to start. Read on to further understand the risk ticks present, & to learn how to identify the ticks of greatest concern & take steps to reduce the risk of acquiring tick-borne diseases so you & your dog can continue to enjoy the outdoors in good health. 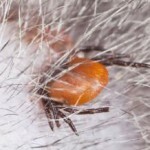 What exactly is a tick & why are ticks a concern? Ticks are external parasites that belong to the same family of bugs as spiders. They have several life stages: The adults lay eggs, eggs hatch into larvae, larvae molt into nymphs, & nymphs mature into adults that go on to lay more eggs. Adult ticks have 8 legs, 2 body parts, a flat body (when their bellies aren’t full of a blood meal), & a hard outer skeleton (hard to squish but don’t even try because you might release any disease they may carry). 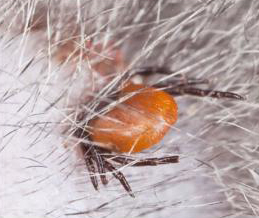 Both adult ticks and nymphs are vectors for (meaning they can carry) certain diseases that can be transmitted to you and your dog when they attach and feed. Not all adults and nymphs carry disease, but some do and their numbers are increasing. Unlike fleas & mosquitoes, ticks can’t jump or fly onto their hosts. Instead, they “quest” when they’re hungry for a blood meal. That is, they cling to vegetation (e.g., a leaf or a tall piece of grass) with their back legs & reach out with their front ones so they can grab on & climb aboard any host that passes by (a bird, rodent, deer, dog, or a person, for example). They can sense a potential host through body heat & vibrations. Click: Tick questing & you’ll see a good example of a tick questing for a meal ticket. Once on board, some ticks wander around looking for the best seat in the house (for example, on or near an ear where skin is thin). Others will settle in wherever they land. They’re pretty hungry at this point & literally do a face plant when they feed, embedding their heads into skin & sucking up blood through a feeding tube for several days. Once they’ve had their fill, they fall off their host & move on to their next life stage. You’d think we hosts would notice, but ticks are really small (hard to see until they’re engorged with a blood meal) & some species release a kind of local anesthetic when they feed so their hosts don’t notice they’re there. It’s only while adult ticks or nymphs are feeding that they can pick up a disease carried by one host & pass it on to another. Which ticks are a concern? Species of ticks found in Canada that will feed on dogs or people are listed below. The ones of greatest concern are the black-legged (deer) tick & American dog tick. (Brown dog ticks are uncommon, & Lone Star tick populations have remained low. They’re a greater concern if you’re spending time in parts of the U.S.) The incidence of most tick-borne diseases is still pretty low in Canada. But black-legged ticks that transmit Lyme disease in particular are growing in numbers, including in the GTA. How can I tell ticks apart? At any point that you’re seeing an area on the ground without snow cover and the temperature is 4°C or higher (let’s say above freezing to be safe), ticks will be out questing for a meal. In our part of Ontario, people & their pets need protection from March through November at a minimum. But given the consistent warm spells we’re seeing during our winter months, we recommend year-round protection. 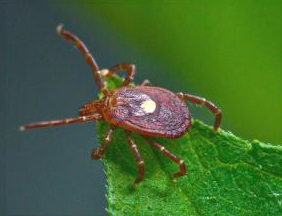 Adult ticks are active in the spring & fall. Nymphs are active during the summer. Nymphs pose the greater risk to people because they’re around at a time when people are wearing shorts & tee-shirts & have more skin exposed, & nymphs are so tiny (1-2 mm in diameter!) they’re hard to spot. How can I protect myself & my dog? We recommend a preventive medication called Bravecto® for your dog, appropriate clothing and bug spray for you, staying on trails and keeping your dog on a leash, & doing tick checks after you’ve been outdoors. It can take as little as 24 hours for the black-legged tick to transmit the bacterium that causes Lyme disease if it’s carrying it, so the sooner you remove any ticks, the better. If you find a tick on your dog, we can run a quick blood test to check for exposure to disease. There’s a nifty 2-pronged tool for the job (pictured left) that we can give you. 1) Pick the large or small one depending on the size of the tick. 2) Engage the tick between the prongs of the tool approaching it from the side. 3) Gently lift & turn (clockwise or counterclockwise) until the tick releases its hold. 4) Disinfect the bite site and wash your hands. Alternatively, grasp the tick close to the skin with tweezers and gently but firmly lift upward. The goal is to remove the tick with its mouth parts intact. (If you leave anything behind it’ll cause a reaction under the skin.) DO NOT put oils, Vaseline, or other concoctions on the tick (we worry that it’ll cause the tick to regurgitate into its host – exactly what we don’t want!). How worried do I need to be about Lyme disease? 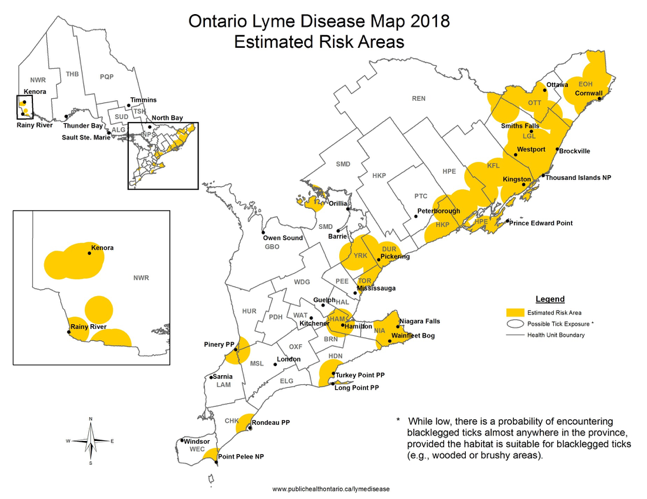 On average, about 1 in 5 black-legged ticks in Ontario carry the bacterium (Borrelia burgdorferi) that causes Lyme disease (less in some areas, more in others). (In areas such as Kingston & Gananoque, up to 40% of ticks are carrying the bacterium.) The vast majority of dogs that are exposed to Borrelia don’t get sick. In fact, only about 5% of dogs develop symptoms of Lyme disease: a lameness that shifts from one leg to another, fever, lethargy, & a loss of appetite. And they can be treated successfully with antibiotics. But left untreated, about 1% of those that get sick develop Lyme nephritis (an immune-mediated disease of the kidneys that’s often fatal). People can also develop serious complications of Lyme disease if it’s not treated. So if you develop flu-like symptoms (aches, pains, headaches) or a bulls-eye-like or other rash where you may have been bitten by a tick, please see your family physician. While Lyme disease is serious, it’s also entirely preventible if you take the appropriate precautions.